My father made the huge piece of art that sits proudly on display at the entrance of the Daley Center Plaza in Chicago. Pablo Picasso designed this particular sculpture—or conceived it…or bent it with artistic vision…or however you want to put it. But my father made it. I’ve believed that since I was a small child. It’s a belief based mostly in filial pride, but there is some truth to it. Picasso, as I understand it, ordered the material for his untitled sculpture from the steel mill where my father worked at the time. 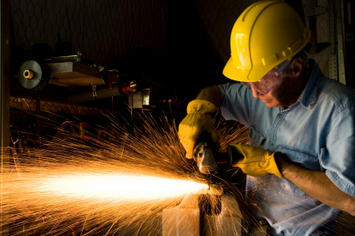 My father handled the job as iron ore mixed with heat and sparks and sweat and swear words on the way to becoming steel. Picasso only took over after things had cooled down. I think of this as city planners ponder what to do with the industrial zone that sits on Downtown’s eastern edge. I can’t help but wonder why Los Angeles County’s role as the largest manufacturing center in the U.S., with approximately 470,000 jobs, so often goes overlooked. Sure, the manufacturing sector has shrunk over the years – and it will likely shrink some more in the future. But you could cut the local manufacturing sector in half and it would still be a giant engine of our economy. It gets bigger when you consider that manufacturing jobs tend to pay more than many service-sector jobs. That means the manufacturing jobs put more dollars in circulation to help finance a lot of those service-sector positions. Manufacturing also brings benefits that defy statistical analysis. Making things – objects or materials that can be touched, like the steel in a sharp sports car or the clothes on your back – is different than providing a service. Here’s what happens with services: The burger is made and consumed. The bed is made, slept in, and made again. Here’s what happens with manufactured products: The steel is used to build a grand cruise ship that steams into the harbor between trips to exotic ports and spills stories that will live for generations. The chair is purchased for some hearing room at City Hall and allows visitors to sit and gather their thoughts before standing up to take part in our democracy. The plastic is fabricated in a way that protects our astronauts as they set out on some historic mission of exploration. And here’s a simple fact: Making things makes people proud – and that’s the best thing you could hope for a city’s populace. I realize that the new lofts that have sprung about around Downtown – including some in the industrial zone – are pretty. I also understand why some land might be more valuable – at the moment, anyway – as a residential development instead of a metal-bending plant or a tool-and-die operation. I also believe, however, that Los Angeles is fortunate to have a major industrial center Downtown. I believe all involved in the current debate over its future should consider that seriously. Yes, manufacturers will continue to face challenges. One of the biggest will come from offshore markets with plentiful and cheap labor. But anyone who thinks industry is done in Los Angeles or the U.S. should keep Italy in mind. The Italians have been at a disadvantage on labor costs since somewhere around the 13th Century. Yet Italy has carried on as a manufacturing center, turning out everything from fine textiles to high-performance motorcycles. Italy long ago made a virtue of design and matched it with manufacturing processes that cannot be easily knocked off in low-wage markets thousands of miles away. It’s time for some enterprising city in the U.S to bring the same virtue to manufacturing – and Los Angeles is uniquely positioned to do exactly that. This will require some land – and history shows it will work best if various manufacturers are clustered together near a lively landscape with a plentiful labor pool and available housing stock. Sound familiar? I hope so – and I hope all involved will see the wisdom of maintaining a healthy and sizeable industrial zone Downtown. After all, some kid’s father might just make a famous artwork for City Hall someday. Jerry Sullivan is the Editor & Publisher of Los Angeles Garment & Citizen.